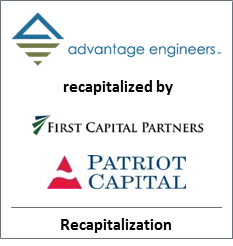 Evergreen Advisors Capital is pleased to announce that it was the exclusive financial advisor to Advantage Engineers, LLC, an industrial consulting engineering firm, in connection with its recapitalization. Advantage Engineers, LLC provides innovative solutions for complex telecommunications, environmental, and geotechnical engineering and consulting challenges. Advantage Engineers was founded in 2001 and is based in Mechanicsburg, PA with additional full-service offices in West Chester, Pittsburgh, and Allentown, PA; Denver, CO; Columbia, MD; and Mt. Laurel, NJ. Advantage Engineers provides comprehensive services in specialized fields of engineering and consulting. They have more than 200 engineering, project and program management, real estate, geological, scientific, environmental and technical professionals. From their seven offices, Advantage Engineers provides services throughout the U.S. The firm is highly sought after by clients in a variety of industry sectors including geotechnical, environmental, and telecommunications engineering. For more information, visit http://www.advantageengineers.com.